There are many ways of using SiteBar as a Firefox bookmark manager. See screenshots with various examples. We recommend Firefox Extension developed by Bas Burger. This installation is a one-time activity. Click Install Now to install SiteBar Client for Firefox 3.0 - 4.0. At the moment it still waits for rewiev by Mozilla but can be installed. Firefox Software Installation dialog will be displayed. The extension will be installed. When finished, it is necessary to quit Firefox and start it again. See how to add a link using Firefox Extension. Click on the Preferences icon. SiteBar Client Options dialog shown below will be displayed. 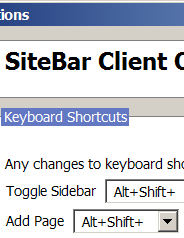 In the SiteBar Client Options dialog select Keyboard.